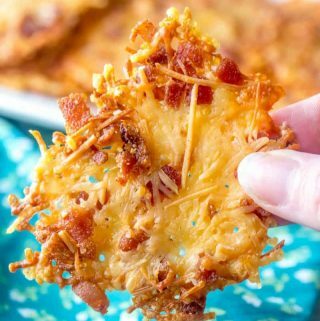 Crispy, crunchy and cheesy these Bacon Parmesan Crisps are a delicious low carb snack that aren't only addicting but quick and easy to make! In bowl mix together all your ingredients. Line a baking sheet with parchment paper or silpat mat. Scoop Tablespoonfuls of your cheese mixture and place in mounds on mat and spread out gently to flatten. Bake for 4-5 minutes until melted and browned on top.